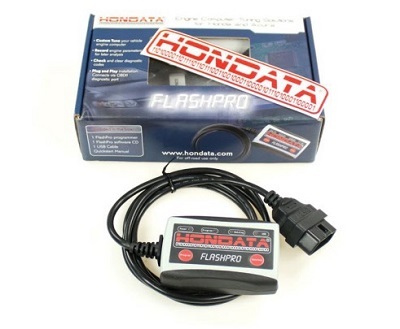 The Hondata FlashPro for 2012 and newer Civic Si and 2013+ Acura ILX 2.4 allows full real-time tuning and datalogging directly through the OBD2 port on your car. Simply plug one end of the FlashPro unit to your OBD2 port on your car, and the other cable of the Flashpro to your laptop. Using the FlashPro manager software you can fully tune your engine without ever removing or physically modifying your Civic Si's ECU. What do I need to run the FlashPro software? • Connects via OBDII diagnostic port. • No ECU modification necessary. • 20 hours on board datalogging memory. 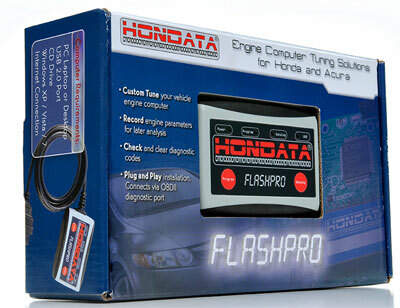 • Check and clear OBD2 diagnostic codes. • Readiness codes and smog check status. • Dual calibration storage - upload from one of two calibrations stored in the FlashPro. • Ignition, fuel, idle speed, table editing. • MAP sensor based tuning. • Rev and launch limiters. • Map tracing & lambda overlay. • Choice of either AFM or MAP based fuel tuning. • Expanded fuel, ignition and knock tables for forced induction. • 4 bar MAP sensor support. • Support for larger injectors. • Injector latency / dead time. • Individual cylinder fuel & ignition trim. • Starting calibrations for NA, forced induction & larger injectors.